Citizens For Marlboro County took their voices to Columbia, SC, on March 5th in protest of the MRR Southern, LLC proposed MEGA-DUMP in the Wallace area of their county. Over seventy people of all races came together for this event. 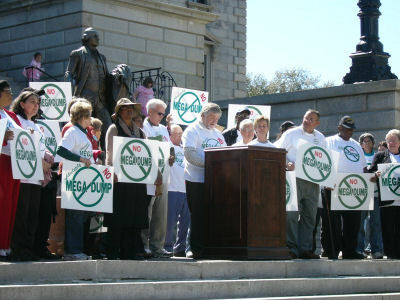 Prepared statements were read in protest of how South Carolinas leaders have "opened their arms" to the waste industry. Some statements asked Governor Mark Sanford and the South Carolina General Assembly to change the laws concerning landfills in South Carolina. Citizens For Marlboro County was organized in 2004 by a small group of citizens concerned about the future of Marlboro County and its citizens. What started out as a small group is now turned into a large to enormous gathering of all races to try to change the "bleak face" of Marlboro. One of their recent accomplishments was to join Blue Ridge Environmental Defense League(BREDL) to fight against a proposed MEGADUMP in Marlboro. Landfills and MEGADUMPS are potential health hazards which destroy our land and fresh water supply. Once they are contaminated, they are contaminated FOREVER! Join the Citizens For Marlboro County that took the time to educate themselves on these dangerous health hazards. Donate to this chapter either by using your Mastercard, Visa, Discover, or American Express card or by contacting the chapter. Please indicate which chapter the payment is for. Thanks! Credit Card donations and payments can be sent using PayPal's Secure Server. Just click on the PayPal logo.